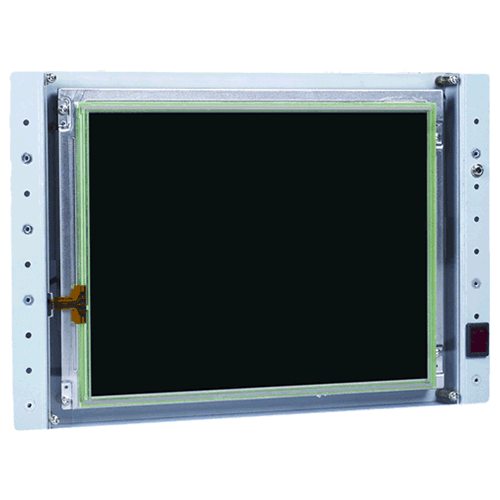 The PPC-E4, an ultra compact Panel PC with a 4.3 inch WQVGA (480 x 272) TFT color LCD and a resistive touch screen. The dimensions of the PPC-E4 are 4.8” by 3.0”, about the same dimensions as that of popular touch cell phones. The PPC-E4 is small enough to fit in a 2U rack enclosure. Unlike other compact Panel PCs, the PPC-E4 comes with either Windows CE 6.0 or EMAC's Embedded Linux distribution installed and fully configured on the onboard flash disk. This allows the software engineer to concentrate on writing applications and not have to worry about configuration and setup. Just apply power and watch the User Interface appear on the vivid color LCD, be it WinCE Desktop or Linux X-Windows desktop. 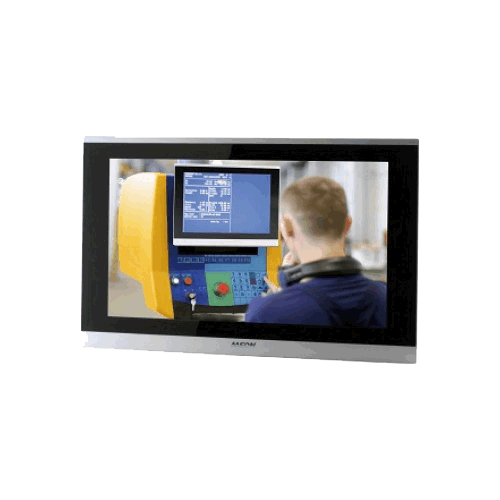 Interact with the PPC-E4 using the responsive, integrated touch screen. 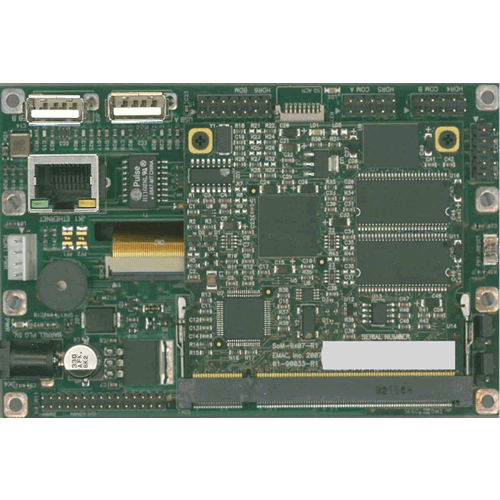 The PPC-E4 compact Panel PC utilizes a System on Module (SoM) for the processing core. This allows the user to easily upgrade, if more memory capacity, sotrage capacity or processing power is required. 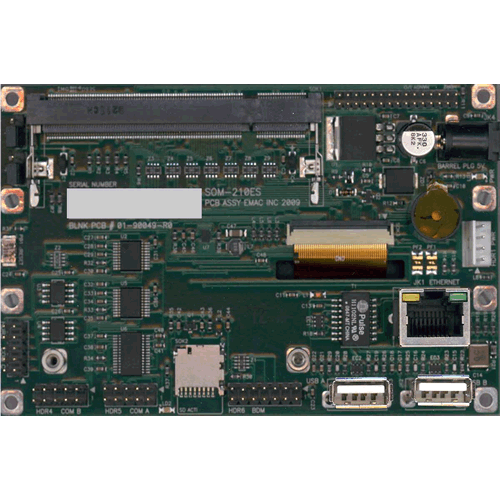 The PPC-E4 includes an embedded ARM 9 SoM; this ARM System on Module features a 200Mhz Fanless Low Power Processor with a Hardware Floating Point Math Coprocessor and 2D Video Accelerator. The SoM provided with the PPC-E4 supports up to 128MB of SDRAM, 64 MB of Flash, and 128K bytes of serial flash. Typical power consumption is less than 5 Watts and the LED backlight can be shut off when not in use to further decrease its power consumption. The PPC-E4 offers two RS-232 serial ports, and one RS-422/485 port. Also provided are two USB 2.0 host ports, an Audio Beeper and a battery backed real time clock. A Micro SD card socket is provided for additional Flash storage. The PPC-E4 can be connected to a network using the 10/100 Base-T Ethernet controller and its onboard RJ-45 connector. When developing CE 6.0 application for the PPC-E4, Microsoft Visual Studio 2005/2008 can be utilized. For Embedded Linux application development, EMAC provides a Free Eclipse IDE. Both Visual Studio and Eclipse provide everything the user needs for developing PPC-E4 applications. All the compiling, linking, downloading, and debugging inherent to software development can be done from one easy to use high level interface. 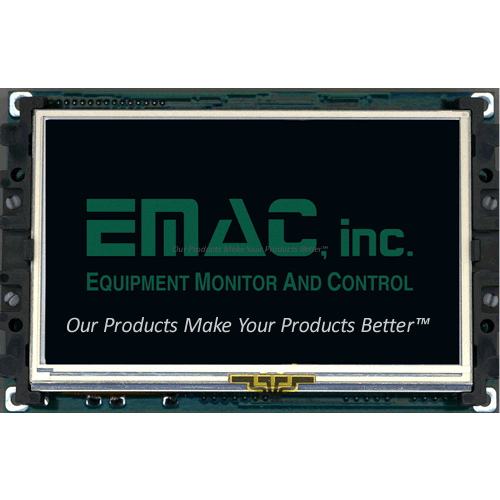 EMAC provides an SDK for the PPC-E4, which contains source examples and drivers. Flash Disk: SPI serial Micro HCSD interface. 2x general purpose 16-bit, 1x 32-bit timer, 2x 16-bit PWMs. Drivers: Serial RS232/422/485, Ethernet, USB, Hardware SPI, Audio/PWM, Video, Touchscreen, Secure Digital (SD), A/D, and GPIO.